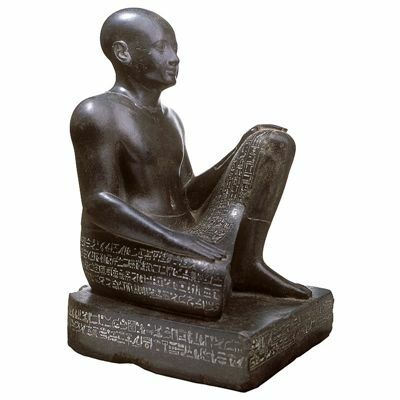 This vizier is shown seated with one leg bent up against his chest and the other resting on the ground; it is the traditional way to sit, and is used by Egyptian peasants to this day. He has a shaven head, delicate features, round cheeks and a small mouth. His kilt is held up by a large belt that is inscribed with details of his life including his titles and those of his father, who was a priest of Libyan origin during the Twenty-Second Dynasty.